Funerary are a band from California that plays an atmospheric form of funeral doom metal and this is a review of their 2014 album "Starless Aeon" which was released by Midnite Collective. A very distorted sound starts off the album along with some drones before going into a slow and heavy funeral doom metal direction and a few seconds later high pitched screams are added into the music and they seem to be influenced both by sludge and black metal which leads up to some dark sounding melodic and deep death metal growls. 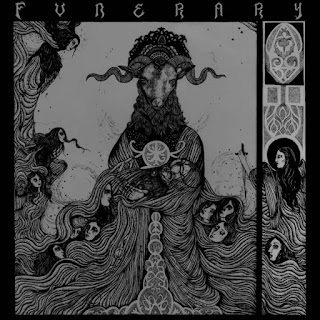 As the ep progresses they start adding in elements of dark ambient drone which they mix in with their heavier sound and they also add in a long and epic in length track along with some melodic chants and the bass guitars sound very powerful on that song before going into a more ambient sounding instrumental and they close the album with another very long track..
Funerary creates some very dark, heavy and atmospheric funeral doom metal with their musical sound as well as making each song have a different sound to them, the production sounds very dark and heavy while the lyrics cover dark and depressing themes. In my opinion Funerary are a very great sounding atmospheric funeral doom metal band and if you are a fan of this musical genre, you should check out this album. RECOMMENDED TRACKS INCLUDE "Beneath the Black Veil" and "Depressor". 8 out of 10.